Spring is here and we browsed the magazines, watched the runway shows and found the looks for less online for you with these privy finds. The look to the left is from ADAM RTW spring 2010. It is important to keep the summer looks contemporty with florals, cardigans and sandels. I love a strong, gladiator heel that has a softer heel. This is such a transitional shoe from day to night. And for under $60 this is a steal from Kensie Girl.Found on http://www.heels.com/. A huge spring trend is the 'jegging' = translation is jean leggings. Joe's Jeans has not only done light, dark, distressed and grey jeggings. All found on http://www.joesjeans.com/ and for under $90! These are all great for a light alteternative with a tunic. Looking for the go-to easy black spring dress? I found a great find on Forever21.com for under $20! 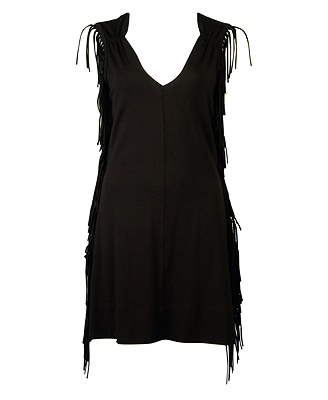 This black fringe dress has versatilty and a trendy touch. Another no brainer spring dress is this one from Bebe. The simpliest, most transitional spring to summer dress is here. On Sale right now, is this white sleeveless silk dress. Click HERE to see it. A great choice for a spring must have is a pastel patterned skirt. A skirt that works with a T-shirt or a blouse with heels. This skirt from Top shop is a great choice for $70! Click HERE to see it. It is not quite time to pack up your scarf, but it is time to pack up your wool scarf. 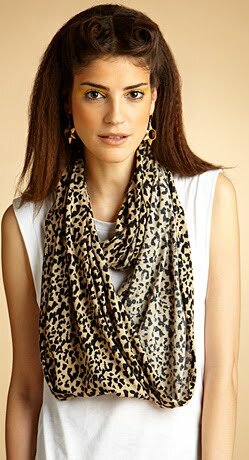 Replace it with this cotton eternity loop scarf in animal print from Rachel Roy exlusively on http://www.rachelroy.com/ for a low price of $38. The perfect earring for spring a feather drop earring. I love these black feather earrings for a shocking $4 at Charlotte Russe. These earrings look expensive but feel free to buy a few to stock up, because these are going to be hot in summer too!